Eggs are relatively an inexpensive meat-free source of protein. They can help avoid diseases, improve eyesight and help lose weight. Mostly they are enjoyed at breakfast or as an ingredient for baking. They also make a quite tasty and popular appetizer known as deviled eggs. Deviled eggs are eggs that are hard boiled and their yolks are removed. These yolks are mixed with different ingredients and are then used to stuff the eggs. In 1800s super seasoned foods were called “deviled”. From there came the naughty food names like devil’s food cake and deviled eggs. 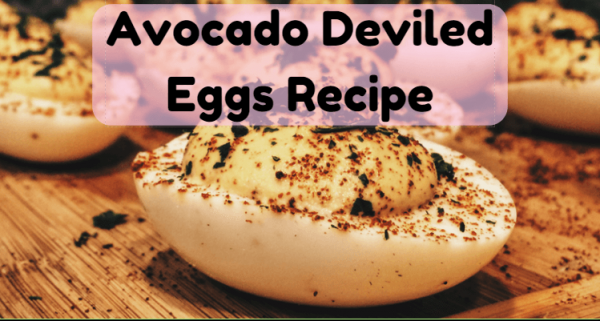 Here is a twisted version of the traditional recipe of deviled eggs, named the Avocado Deviled Eggs. If you love avocados than this is something that you will enjoy. When mixed with egg yolks, the smooth and creamy feel of the avocado gives a wonderful compliment. So, try it out and enjoy the delectable flavours. Scoop out the egg yolks in a bowl. Add avocado, mayonnaise, 2/3 of turkey bacon, garlic, lemon juice, salt, and cayenne pepper. Mix until the mixture is evenly combined with the mashed egg yolks. Spoon the filling in a plastic bag or piping bag with one corner snipped. Pipe the filling out into each egg white. Top it with pieces of turkey bacon, slices of jalapeno and dash hot sauce. This recipe of Avocado Deviled Eggs is suitable for different types of diets, I.e. vegetarian, dairy-free, paleo and ketogenic. In simple words, there is no reason for you to not make it. Deviled eggs are a famous appetizer for several family gatherings and parties. Adding a twist to these traditional eggs with avocado will catch attention and will make them exciting. Also, its green colour will be a fun addition to parties like St. Patrick’s Day or even a Dr. Seuss. Note that these eggs can be made in advance and stored chilled and covered. You can serve them with crackers. You can increase the amount of the avocados added and can top the eggs with a sprinkle of smoked paprika. Enjoy the creamy and rich taste of the avocados mixed with egg yolks. So, try it out. Remember it is easy, delicious and different.